These women dressed alike in checked capes and feathered masks. Mike Schwartz, right, owner of Wohlner’s at Midtown Crossing, with other event sponsors. 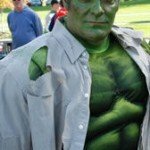 The Incredible Hulk was bursting with enthusiasm. 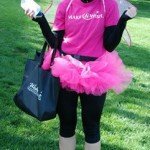 The Make-A-Wish fairy is ready to ride! 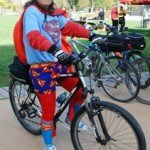 This woman dressed as Superman. 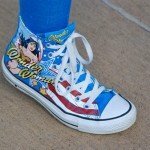 . . .
. . . but had the greatest Wonder Woman shoes! Chewbacca and Darth Vader visited but didn’t ride. 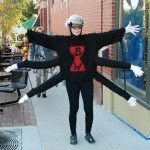 This spider woman had plenty of helping hands. If you saw a a few caped superheroes and masked marvels in midtown Omaha Saturday, you weren’t seeing things. Those were the 250+ participants in the first annual Super Cruiser Ride. The Oct. 19 benefit was organized to raise funds for Make-A-Wish Nebraska. My brother-in-law, Mike Schwartz, is owner of Wohlner’s at Midtown Crossing, and was one of the sponsors for the ride. At his request, I volunteered to take pictures at the ride. This was so much fun! I arrived at Turner Park at 2:30 p.m., about 30 minutes before the start of the ride. Everyone was dressed in capes, masks, tutus and goofy hats to portray their favorite super hero. 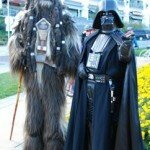 Darth Vader and Chewbacca also made an appearance, althought they didn’t ride. Chewbacca said his costume weighed more than 60 pounds — maybe that had something to do with it. 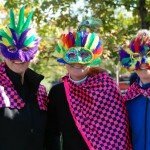 My favorite costumes were the pink Make-A-Wish fairy, the Incredible Hulk, and the three women with the pink-and-black checkered capes and feathered masks. One woman dressed as Super Man, but had on the most amazing high-top canvas Wonder Woman shoes. After the 3 p.m. start, participants followed an 11-mile course that wound its way through Midtown Omaha up to Benson, down to Field Club and back to Turner Park, with several refreshment stops on the way. I stationed myself at 50th and Underwood to catch riders as they passed through Dundee. Many stopped to rest and enjoy the specials at eCreamery, Dundee Dell, Amsterdam Falafel & Kabob, and the Beer and Loathing tavern. I returned to Turner Park at 5:30 p.m. for a few wrap-up photos, then headed home. By that time, most of the participants were having so much fun at the stops along the way that they hadn’t made it back to the park. 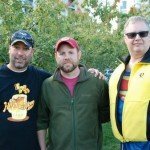 As of Monday morning Oct. 21, Mike didn’t have a final total on the amount of money raised. He said they learned much from this first-time event, and plan to make it an annual one. I’ve posted a few photos here. All photos from the event are in my SmugMug gallery.